6 February 2010, at 2:03p.m. PHILIPPINES - Vethealth Corporation exhibited Meriden’s products at Inahgen 2010, The Farmers Congress exhibition in the Philippines. Pictured from top to bottom:Meriden Animal Health Limited, Vethealth Corporation Team, Vethealth Corporation stand, Dr Inga Shahin MRCVS. 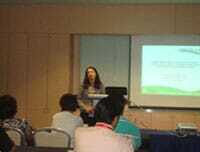 Dr Inga Shahin MRCVS, of Meriden Animal Health Limited presented the ‘Latest Developments in Research on the Use of a Natural Based Additive to Improve Health and Nutrition in Intensive Farmed Animals’ to an enthusiastic room full of small farm holders. Having the opportunity to present to end users and being able to answer their direct questions and give advice is always a great pleasure. Meriden Animal Health Limited would like to thank Vethealth Corporation for all the hard work they did to make Inahgen a successful event.